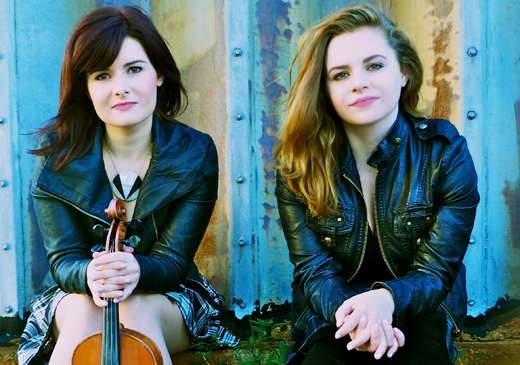 From trad music summer school to contemporary arts festivals, check out Irish America’s event listings for June and July. New York City’s most Irish American neighborhood celebrates its 6th annual Irish festival this summer. Billed as a “weekend of music, food, drink and family fun” and sponsored by the local AOH chapter, the Rockaway Beach Irish Festival takes place on the Rockaway Peninsula, once dubbed the Irish Riviera for the 25 percent of residents who claim Irish ancestry according to the latest census bureau statistics. Free admission. – A.F. The Riverfront Irish Festival celebrates its 25th year this summer with family friendly fun featuring music stages, an “Irish Market Place” with traditional Irish and American fare, Irish Mass on Sunday, and traditional Irish dance. 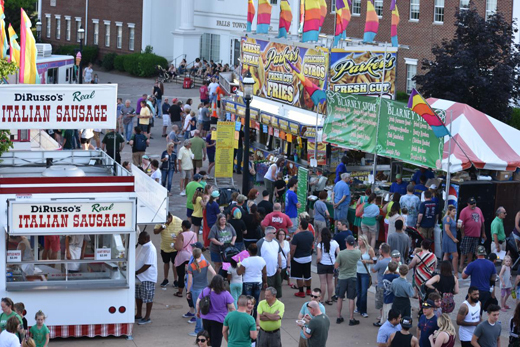 The festival will also be part of the summer-long grand opening celebrations of Cuyahoga Falls’s newly revitalized downtown, which will see a formerly neglected riverfront pedestrian mall re-opened to vehicle traffic. Mayor Don Walters recently told the Akron Beacon Journal that the city is “thrilled to reactivate the north and south ends of Front Street and to welcome everyone back to downtown Cuyahoga Falls.” Free admission. – A.F. Chicago’s premier Irish cultural center is hosting its 33rd annual celebration in honor of all things Irish the weekend following the Fourth of July, featuring the best local and international musicians, including new headliners JigJam and Byrne and Kelly as well as festival favorites Gwelic Storm and WeBanjo 3. In addition to contests for adults and kids, dozens of food and artisan vendors, the center will open up its art gallery, library, and museum for cultural exhibits and programs. $10/day advance through July 3; $15/day regular price. – A.F. Tens of thousands gather every summer amidst a backdrop of the Rocky Mountain Highlands just a short drive from Denver to celebrate their Irish heritage. With three days full of contemporary and traditional Irish music, dance, Gaelic games, food, drink, and even sheep herding, this festival offers a bona fide slice of Ireland in America. This year, new bands like JigJam and The Go Set, as well as stalwarts like Screaming Orphans, Cassie and Maggie, and The Elders hit the main stage. $7 Friday; $14 Saturday and Sunday ($11 advance through July 11). – A.F. 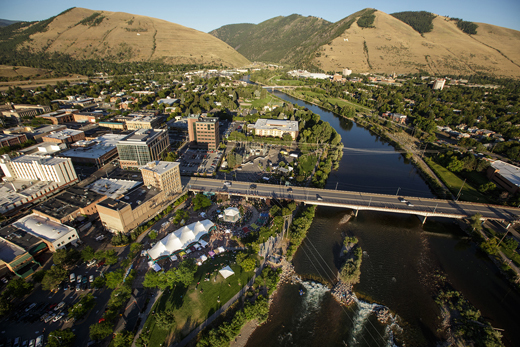 The Big Sky State keeps its Irish connects alive every summer with the Celtic Festival Missoula, a celebration of that unique history and how Irish culture has evolved into new and modern forms in the years since the Irish language was a lingua franca of the mines. The mission is simple: “to perpetuate Celtic culture and to introduce the culture to future generations in Montana.” This year, contemporary bands like Seven Nations, Stout Pounders, and Screaming Orphans will perform alongside traditional Irish groups like Floating Crowbar and the Haran Irish Dancers, Celtic Dragon Pipe Band, and Missoula’s own Irish Dancers. In nearby Florence, the Missoula AOH is sponsoring the sixth annual Irish Road Bowling event for those interested in learning a classic Irish pastime. Free festival admission; $20/team of two for road bowling. – A.F. The Ceilidh Pub in Judique, Cape Breton is hosting a daily Celtic experience over the summer. Offering lunchtime (11:00-3:00) admission, the pub has announced a special rotation of live performances of traditional Celtic music to serenade visitors who stop by, with the option to partake of a wide-ranging menu including a seafood selection reminiscent of dining on the Irish coast, sourcing exclusively from local stock and produce. The shows will present local talent as well, showing off an eclectic combination of performers old and new. 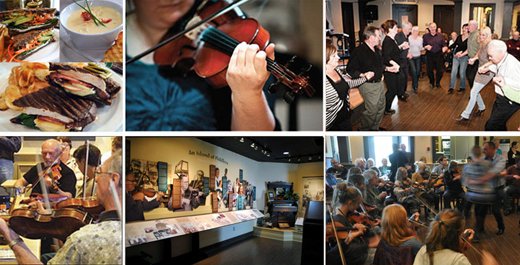 The series of shows are being sponsored by the Celtic Music Interpretive Centre, as part of an endeavor to reassert the influence of Celtic tradition in Nova Scotia. – M.G. Canada’s Irish Fest parade, Miramichi. Photo: John Kernaghan. Billed as “Canada’s Irish Festival,” the Miramichi Irish Festival is Canada’s longest-running celebration of Irish heritage. The weekend-long bash, which annually sees attendance in the thousands, starts out with the Scott McKay Memorial Irish Open, closing with an evening concert led by former Irish Tenor Ronan Tynan. Pub gatherings, a cruise along the tranquil Miramichi River, and live entertainment are also scheduled for the occasion, including multiple performances by the Nelson Doyle Dancers. 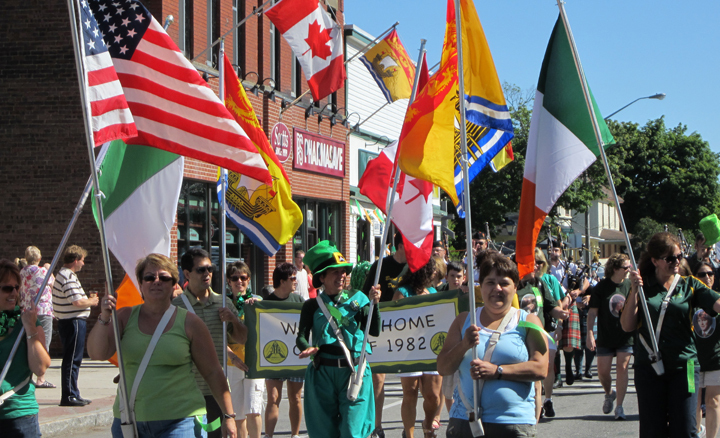 New Brunswick’s vibrant Irish ancestry will be commemorated in the yearly reception hosted by the Irish Canadian Cultural Association on the 19th and the family walking parade on the 21st. – M.G. Westport, County Mayo on June the 8th until the 10th are holding the Westport Folk and Bluegrass Festival. The festival promises to be a grand time for those who enjoy three full days of “Pickin’, pluckin’, bowin’, blowin’, strummin’, slappin’, slidin’ & old-style harmonisin’ in Ireland’s acoustic-music capital.” All of this and more will be performed by groups such as the Gold Heart Sisters, the Buffalo Gals, Bernie Phaid & Dave Clancy and many more. These performances will be held throughout Westport. 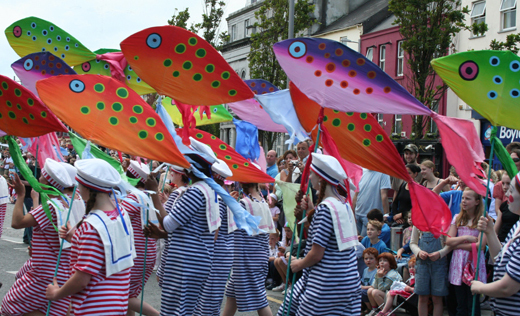 The festival is brought to the people of Ireland by Fáilte Ireland and Destination Westport. – D.L. The Willie Clancy Summer School, named in honor of the legendary County Clare musician, is offering a summer school from July 7th to the 15th in which there is a panoply of traditional Irish music, Gaelic language classes as well as American dance workshops one can attend to learn the ancient Gaelic arts of music and eloquent prose. All of these classes are held in various locations throughout the town and can be accessed by a one time fee of €140 which covers all classes. Enrollment starts from July 7th from 2:00pm to 6:00pm and July 8th from 4:30pm to 7:30pm. – D.L. Galway will host their acclaimmed Galway International Arts festival from July 16th to the 29th this year. The festival is a multidisciplinary festival that exhibits various art forms that include; theatre, dance, music, opera, street acts, visual arts and many more! This year, many critically acclaimed acts are performing at the festival. These acts include musical acts like The Flaming Lips, talented singer, Gavin James and Kodaline. A performance from Gravity & Other Myths, an Australian contemporary circus act should bring audience members a new take on equilibristic feats garnering a unique experience. – D.L.